High temperatures were mostly in the the low to middle 70s on Saturday. Then rebounded into the 80s on Sunday. Today the temperatures will be back into the downward cycle with maximums projected to be mostly in the 70s to near 80°. The warmer air on Sunday was associated with a brief surge of warmer air associated with an area of low pressure moving across southern Canada. Just as quickly a cold front moved in behind that low, trigger off some isolated thunderstorms and shifted the wind to the northwest. July 19, 2015 early evening radar. That northwest wind will continue through the day helping draw in the cooler Canadian air and the corresponding 70s for maximums. That northwest wind is expected to average in the 10-20 mph range much of the day with the usual higher gust on occasion. No rain and/or thunderstorms are are projected for today or tomorrow in eastern North Dakota. 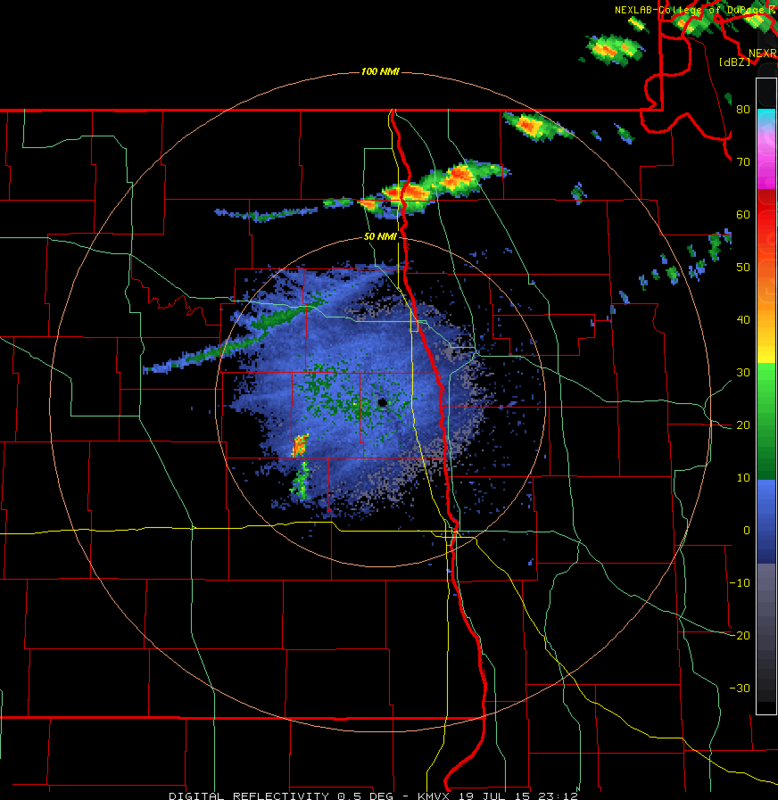 Western North Dakota should be dry today but may record some isolated activity on Tuesday afternoon. 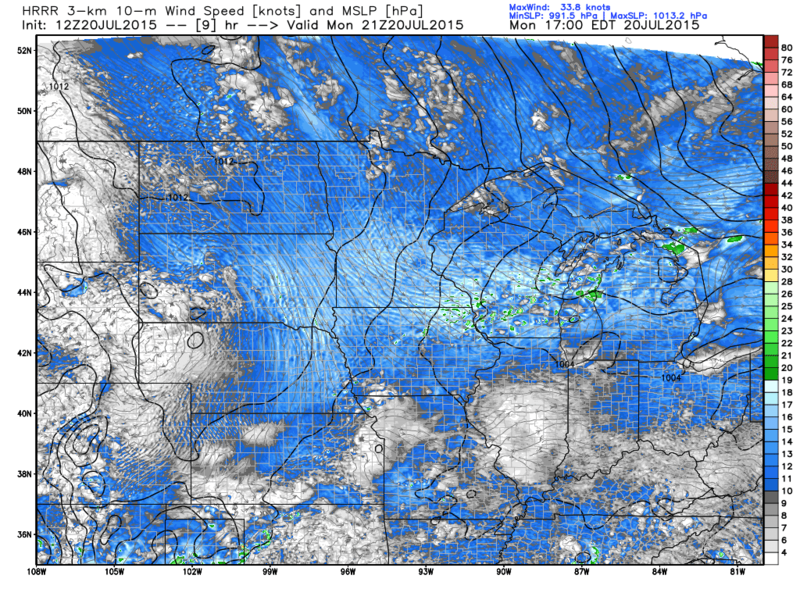 Then some hit and miss storm Tuesday Night into Wednesday morning is expected. That precipitation is in many ways associated with warm air advection and indeed it will be getting warmer later in the week. 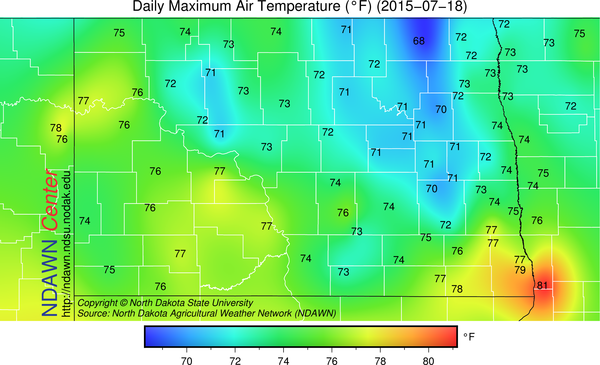 The maximums on Tuesday will be warmer yet many locations in northeastern North Dakota will still record high temperatures in the 70s, but mid 80s are expected in western North Dakota. Although the temperatures will be warmer tomorrow, the dew point temperatures are expected to remain in the 50s for both today and tomorrow. 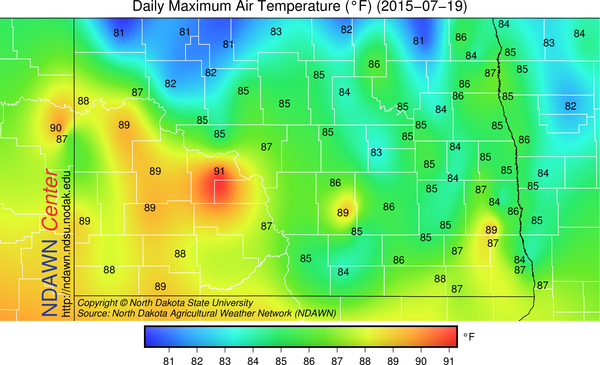 It will be Wednesday into the weekend when dew points will be mostly in the 60s in eastern North Dakota. 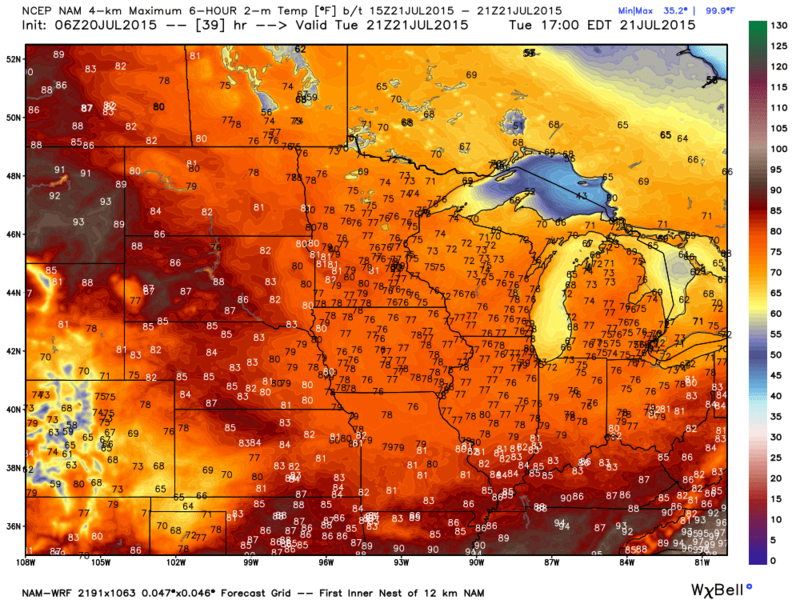 With dew points in the 60s, the minimums will in turn also be in the 60s. The higher dew points will mean more heat stress on cattle, higher relative humidity values and therefore more “fungal” possibilities on susceptible crops. 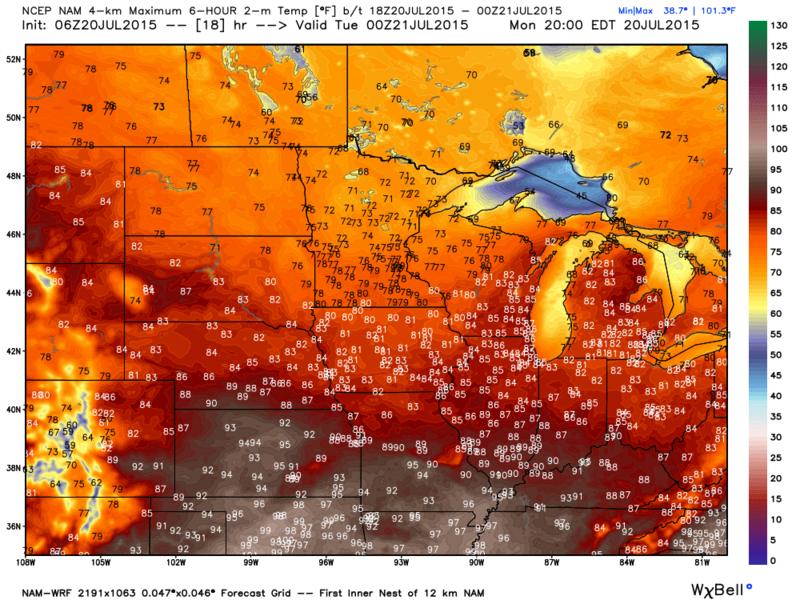 The maximums during that period will be in the 80s. Therefore, temperatures overall will be in the 3° to 5° above average range for that stretch.